Ducks can be one of the most difficult types of waterfowl to identify. Not only are there many different types of ducks, but they often form mixed flocks and similar species can be seen in close proximity. Hens in particular can be challenging to distinguish, and many ducks’ propensity to hybridize creates even more identification challenges. These duck identification tips can help you learn to sort out which duck is which so you can always be confident that your birding skills are just ducky. To properly identify ducks, you must be properly equipped. Optics: Strong birding binoculars are necessary to help pinpoint the subtle details in plumage and body shape that can distinguish one duck species from another. Choose binoculars that have anti-glare coatings and waterproof features to keep them protected against the elements and to help the images be as clear as possible. A spotting scope can also be useful if you plan to look for ducks on large bodies of water. Field Guide: A field guide is an essential tool no matter what birds you hope to identify. For ducks, choose a field guide with extensive listings for waterfowl and be sure it has a section on feral, exotic, and hybrid ducks for completeness. Ideally, photos or illustrations should show the birds both at rest and in flight. Clothing: Birders who are comfortable can take more time to properly identify birds. Loose clothing is best, and opt for neutral colors whenever possible. Choose footwear that has good traction for slippery or wet surfaces, and consider wading boots if you will be visiting marshes or bogs. Long sleeves will provide sun protection and can help deter insects as well. Many duck species can be easy to identify visually if you know what to look for. Because these are larger birds that can be seen on open water, it is often easy to pick out different field marks for a proper identification. When watching ducks, look for these characteristics to identify the species. Size: How large is the duck? How do the head and neck look in proportion to the body? What posture is typical for the duck at rest? How high is it floating in the water? Head: What markings are visible on the head? Is there a brow or eye line, cheek patches, or a head crest? Is the head round, sloped, or elongated? Bill: What is the size and color of the bill? How big is the nail, and is it a different color? What is the bill’s thickness and slope? Are both mandibles the same color? Neck: What is the neck length? Does it show any unique rings or coloration? How does the bird hold it at rest, when aggressive, or when feeding? Plumage: What are the most prominent colors on the back, rump, neck, breast, and flanks? Is there any iridescence or bold color patches? Is the plumage streaked, spotted, or marked in any way? Speculum: Is the duck's speculum a unique color? Are there any borders or stripes next to the speculum? How large is the speculum compared to the full wing? Legs: What color are the legs, and how long are they? Where are they positioned on the bird’s body? Does the duck walk well on land? Tail: How long is the tail? It is held stiffly upright or slack behind the body? 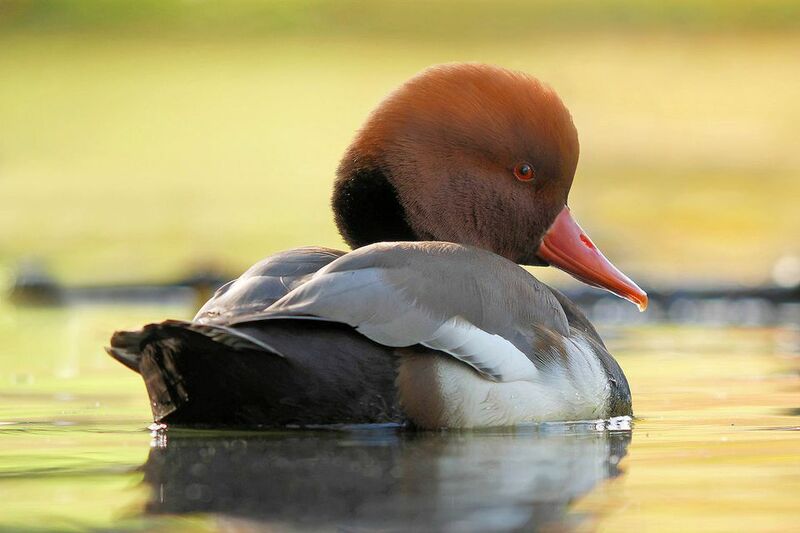 While male ducks, also known as drakes, can be easy to identify by sight alone, hens can be more challenging and it may be necessary to consider other characteristics as well for positive identification. In addition to general appearance, there are other ways to identify ducks conclusively. Range and Habitat: Where the bird is sighted is a great clue to its identity. While many ducks are widespread geographically, they tend to prefer the same types of habitat wherever they are found. Knowing water depth, vegetation, and whether it is fresh or salt water can help you discover a particular duck’s identity. Feeding Behavior: Ducks feed in different ways. Dabbling ducks “tip up” to feed on vegetation, while diving ducks will disappear completely below the surface of the water to find their next bite. Note the bird’s feeding behavior as well as what it eats and whether or not it forages on land to help you identify the species. Sounds: Not all ducks quack, and not all quacks sound the same. Learning to bird by ear can help you distinguish different ducks’ identities. Pay attention to nonverbal sounds as well, particularly any noise the birds’ wings may make in flight. Flocks: Many ducks tend to be quite loyal toward their own kind, so if you’re stumped on a mystery duck compare it to others in the flock, particularly those it is closest to and seems to stay near. While mixed flocks are common, most ducks will prefer the company of their own kind and their neighbors can help you confirm an identity. With practice, it is possible to identify ducks by sight, behavior, and sound. While there may still be mystery ducks that are impossible to puzzle out, the more you observe ducks and put your identification skills to the test, the more confident you will be identifying every duck you see.